My cabinet still needs the facings and doors, but it is ready to begin using. Now I just have to decide what to put where. This is proving to be a challenge after going so long with only using plastic buckets and baskets, and tucking things here and there. The cabinet is about six feet tall and seven feet wide. I do have another shelf for my stuff in an alcove at the bottom of the stairs. 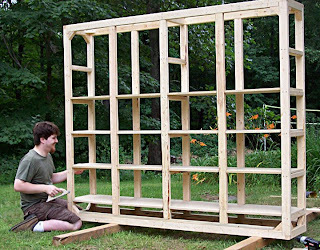 Hubby also wants to build U shaped shelves to better utilize that space, but that project didn't rank high on the priority list. Until the doors are on, I can only use the bottom shelves for anything I don't mind the baby getting into. So far, that is only a pile of jeans to be recycled for a project. The doors will likely be on before I fill up the top shelves. I'm finding it very time consuming to refold the many pieces of fabric to stack nicely. I've started with the crazy quilt fabrics on one side, the quilting cottons on the other side, and the fabrics for making clothes in the middle. I haven't come across them yet, but there are is also the fabric for making fashion doll clothes that will need a home. Yarn may go on the bottom shelves if there is extra space. If not, it will probably stay in buckets that I can stack under the window next to the cabinet. Eventually, I need to organize the alcove better and hang a curtain to conceal the chaos. The shoe box size containers are filled with a variety of things. 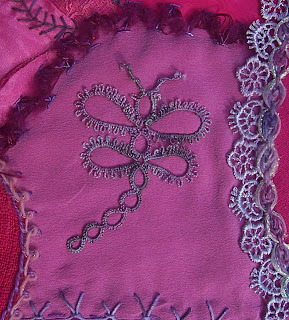 Some contain crazy quilting embellishments, various motifs, bits of lace, and such. Some contain fabrics for doll clothes that have been cut out and are waiting to be sewn. Some contain supplies for things that don't require much space, like tatting or dying. Others contain supplies for an individual project, like the jean bag I started way back when. There is a stack of floss boxes filled with various buttons and beads and what not. One bucket is filled with patterns for doll clothes. Another has drawers full of beads and fibers and Christmas ornaments to paint. There are a couple of shelves of scrapbooking supplies. In front of it all, is a pile of random craft supplies and mishmash to keep the baby from getting to the shelf. 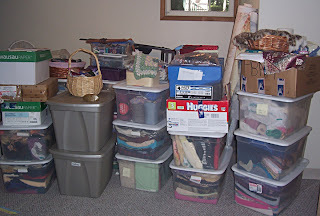 When it is better organized, perhaps I'll stack the buckets of yarn here instead. Craft and sewing supplies are also stashed in several places they don't belong, for the sole purpose of being out of the baby's reach. I didn't take pictures of everything, but you get the idea. I'm really looking forward to getting organized. Maybe then I'll actually be able to focus on more stitching. After two months of work, I was finally able to plant my garden. 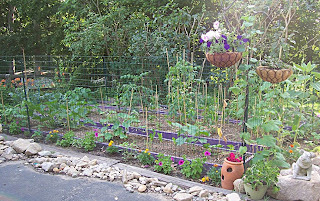 My wonderful husband built the raised beds and installed the fence for me. I planted about a week into June. The plants are not as big as they could be, but they're coming along nicely. There are still piles of gravel and rocks to be moved and used in other projects. Those projects just aren't as urgent as preparing the garden was. I have done a couple of minor outdoor projects, but the focus is now inside. There is still unpacking and organizing to do. 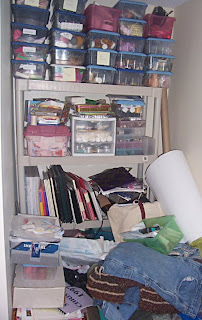 I'm hoping having the cabinets to organize my stash will have a domino effect and enable more organizing elsewhere. This will be the first time my stash has a real home. It's always been just 'stashed' somewhere out of the way. Well, sometimes it wasn't so out of the way, but I'm a creative type. Chaos is sometimes unavoidable. I'm also hoping this will make using it much more efficient and therefore, pleasant and productive. I am finding more energy for creativity and stitching again. Mostly, this happens after my littlest angel goes to bed at night. It's really wonderful to curl up at night with my husband, me with my stitching and him with his drawing, and enjoy our own house that is feeling more like home all the time. Finally, I have some stitching pictures to share. 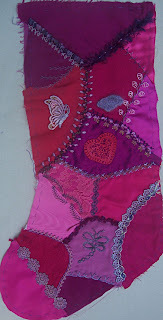 I haven't stitched much since I started digging the garden, but I did sew a couple of motifs onto the pink and purple stocking. 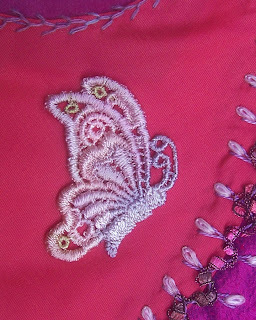 The first is a Venice lace butterfly. Some time ago, I dyed it with inks meant for re-inking stamp pads. I did heat set it, but it still washed out quite a bit. 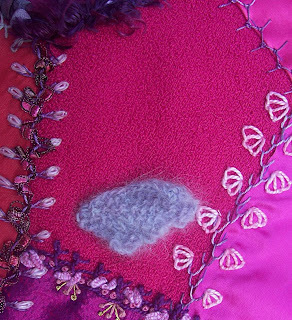 It turned out to be a lovely pastel motif that is just right for the stocking. My little angel loves butterflies. The next motif is a tatted dragonfly. I started it a few years ago and ran into a tangle near the end. It was still in the box of unfinished tatting when I stumbled across it. The colors go perfectly with the stocking, so I pulled it out and finished it. There was really only a bit of unpicking to do, and then finish off the head. This last bit is only the start of a motif. It's a bit of knitting done with tiny little needles. It may have been a swatch when I was knitting doll sweaters or the start of a scarf that was abandoned. Either way, it was a scrap that looked like a miniature blankie. My little angel doesn't really have a blankie, but she does like her blankets. I had thought to add a bouquet of flowers coming out of the top of it. Now, I'm wondering if I can find a suitable cherub to tuck under the edge and hold the bouquet. Here's a photo of the whole stocking as it is now. I have the best husband. His parents came to visit last week, to see their only grandchild and the new house. Hubby was on vacation. He and his dad spent the whole week building me a cabinet for my stash. Hubby is an artist and never did this stuff as a kid. Now that he has his own house, he's taken an interest in building stuff. He made plans for three projects and had the lumber delivered a couple weeks ago. His dad was only too happy to help him while they were here. 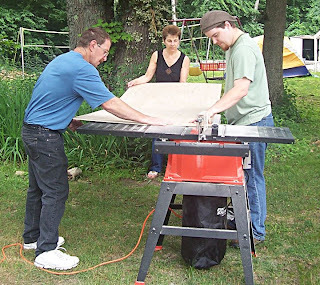 I think they both had a great time building, sharing ideas, and doing the male bonding thing. Hubby's mom helped, too. We must have spent a couple of hours at Lowe's getting hardware, tools, and extras. His mom picked up a few extra things she thought we could use. Turned out pretty well, the things she bought us came in handy. One of them was the long level. She had great fun using it to check on how the men were doing. She was also there to help any time they needed an extra pair of hands. It was a great week. They were predicting thunder showers most of it, but the weather held out wonderfully. It only sprinkled a couple of times while they were building. Even then, it wasn't too much to make them stop. 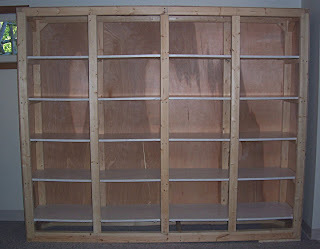 By the week's end, they had the framework done and the shelves cut and notched. At that point, it was getting pretty heavy. They were taking it out of the basement each morning to work on it and putting it away at night. Each night it was a bit heavier. 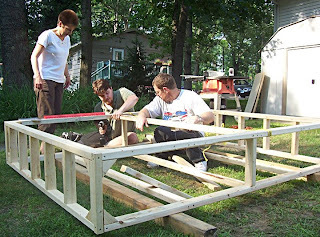 After the frame was done, they decided it would be best to continue the cutting outside, but finish the building where the cabinet will be located. It's made to fit along part of a wall in the basement family room. They weren't able to finish the cabinet before we took his parents to the airport Sunday. That morning, they cut all the paneling and doors. All that's left now is for my husband to cover the shelves with contact paper, sand a few rough spots, and install the paneling and doors. Actually, the trim for the doors may need to be cut still. It's slower going, now that he's back at work, but it's coming along. With any luck, it might even be finished this weekend. Oh wait, I still need to pick out handles for the doors. I didn't like anything they had at Lowe's and wanted to check another place, or maybe even pull out the polymer clay and make some. That could be fun. I did get to help with the cabinet a couple of times, but mostly I was occupied with the baby or cooking. It was great having extra people to cook for. I think hubby and the kids enjoyed the extra variety in the meals. I may have to put more effort into menu planning for just us, too. We don't need the extra desserts and such on a regular basis, but some of the main dishes would be nice to have more often. The baby and I had our own bit of fun while the men were building my cabinet. 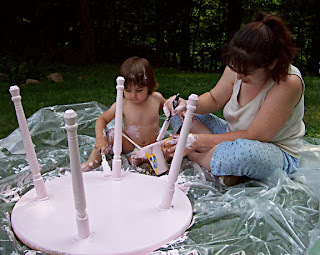 Hubby put together the table pieces we picked out and we painted it. 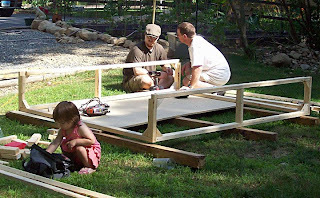 It's not the neatest project to let a baby help with, but she had fun and knows that she helped make it. She dipped her brush and slopped the paint on. Then I spread it around and wiped off the excess. It's a nice pale pink. When the baby is sleeping, I may sponge on a bit of gold mixed with glaze, not to cover the pink, but just add a bit of shimmer. Then I want to paint butterflies and flowers around the edge for her, maybe a couple of fairies, too. I think she'll like that.